Didn’t they all look resplendent. Their outfits gleaming in the May sunshine as the crowds gathered from far and wide to be there on the happy day. But enough about the return of the Royal London One-Day Cup and Lancashire’s all-green kit – which is to fashion what Brexit is to dinner party conversation. The first day of the competition, like another slightly more talked about event, was met with great excitement. Lancashire’s task was to upstage the reigning champions Nottinghamshire and they made a good fist of doing so. Keaton Jennings’ sensational century – his third in succession across two formats – almost guided the hosts to victory at Old Trafford, but ultimately they fell nine runs short of their required target. It was difficult to shake the feeling from the outset that Lancashire had more bowling options than one could ever need, and so it proved. Eight bowlers used, with a ninth available if needed, but far too few batsmen to adequately support Jennings in that chase. So Lancashire move on to another home clash, this time against Jennings’ old side Durham. They too suffered opening-day defeat, though theirs was a slightly more chastening experience, hammered by Yorkshire at Chester-le-Street. 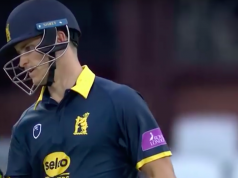 Tom Kohler-Cadmore did the damage to the Durham bowlers with a blistering 164. The chase never got going as the Jets stuttered to 186 all out – losing by a whopping 142 runs. Bouncing back is the order of the day then for both sides at Old Trafford. 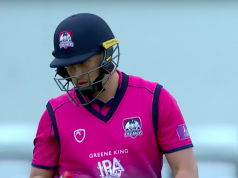 Lancashire won the only contest in this competition between the two sides last season, as Dane Vilas’ century helped his side to victory in the North East. Jennings’ first match against his former side isn’t the only sub-plot of interest. Graham Onions may also have the same experience if he features for Lancashire and there is the battle of the Clark brothers – Jordan for Lancashire and Graham for Durham. There can’t be too many more promising young English bowlers around than Lancashire leg-spinner Matt Parkinson. Having spent the winter in Australia, before impressing with the Lions and in the North v South series, the 21-year-old has started the season superbly. He’s played in two of the County Championship matches, including taking eight wickets in the match against Somerset. Parkinson made his List A debut for Lancashire against Notts and returned career-best figures of 5-68. He’s a crucial weapon for his county and can’t be far off England’s radar. Paul Collingwood had the pavilion at Emirates Riverside named after him on Friday ahead of the Yorkshire clash. It wasn’t the way he’d have wanted to mark it but, a week shy of his 42nd birthday, Collingwood remains as crucial to Durham as ever. He even opened the batting in that match, a rare sight, as well as delivering his full allocation of overs for the cost of just 40 runs. Lancashire will surely opt to include an extra batsman after their bowler-heavy line-up against Notts. Karl Brown could come into the side having been part of the squad on Friday, while Graham Onions could also feature. Durham have named an unchanged squad for this clash with Tom Latham skippering the side. It’s set to be dry, sunny and very warm for this one. Thursday’s match against Notts was a good batting track though Lancashire would like it to offer a bit more spin. The outfield is lightning fast, so a high-scoring game is possible.